Today, you all have the perfect excuse to wear a huge grin on your face as it is officially World Smile Day. 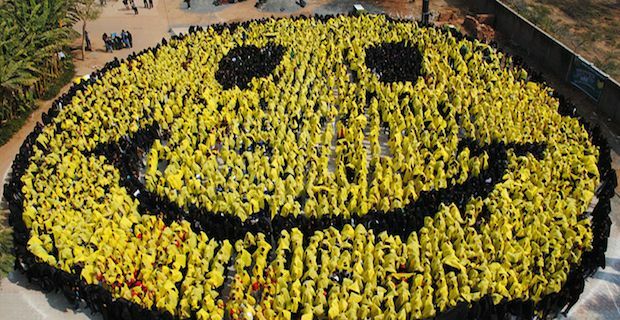 The day was created by Harvey Ball, the American artist responsible for creating the smiley face, after he began to worry that his creation became overly commercialised, so much so that people had begun to forget the original intention behind the iconic image. His response was to create World Smile Day, which traditionally, falls on the first Friday of October each year. The idea behind the day is to make the world a happier place by encouraging people to smile more. The official slogan for the day's organisers, the Harvey Ball World Smile Foundation, pretty much sums up the goal in a concise manner: "Improving this world, one smile at a time!". Coupled with flashing a smile at each and every opportunity you get, it is also strongly encouraged that you engage in kind acts for the people you will encounter today. That may mean helping a stranger do something they are struggling with or doing something unexpected for a loved one but whatever shape or form it takes it will mean that you and one other person will be happier based on your interaction. This year, organisers are looking to tap into the incredible power of social media and will be asking willing people to post smiling selfies of themselves online while holding up a message with the word Smiley included along with with the hashtag #worldsmileday. This will have the added benefit of raising awareness among individuals that may otherwise not hear about the day. There are also going to be plenty of Smile events taking place around the globe today so if you are interested in getting involved then keep track of what is going on in your area through Facebook and Twitter. Also, feel free to get your own event going. For more information on how to organise a Smile event, check out www.worldsmileday.com for some support and ideas from fellow enthusiasts.